If Avi Friedman were designing the Ivory Tower, he’d make it only one floor but with the possibility of easy expansion. He’d also do away with expensive ivory and use affordable, pre-fab materials that were snapped into place without a fuss. Finally, rather than the mythical metaphysical space of solitude and sanctity disconnected from daily realities, he’d make sure the tower had easy access to the community from all directions. Friedman, a professor in the School of Architecture, has been on a 20-year mission as an advocate for and the architect of affordable homes for all. “In 1990, Canada woke up to the realization that housing wasn’t as affordable as it used to be,” said Friedman. The project moved from the drafting table to the construction site later that year, when Friedman built the prototype Grow Home on the McGill Campus. Smaller than conventional houses, the house was designed for increasingly smaller families and first-time homeowners. But, asked critics, who wanted a house that was 14-feet wide? A lot of people apparently. Twenty-four units were bought the first weekend they went on the market and the first development of 89 units sold out in two weeks. As Friedman’s design made headlines in the New York Times and L.A. Times, more than one thousand units were built across North America and Europe in the first year alone. In 1998, Friedman took a sabbatical in Guadalajara, Mexico where he was stunned by the living conditions of the poor. Back in Canada, Friedman’s expertise has been in constant demand. 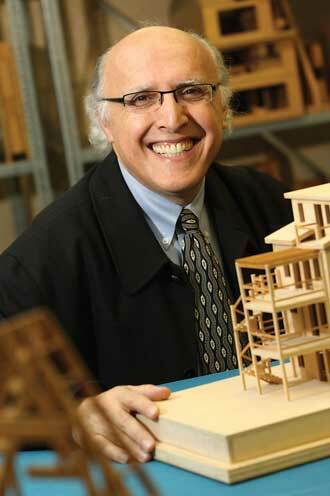 He and his students have helped with dozens of urban renewal projects, flying into cities like Lethbridge, Ab. ; Regina, Sask; and Fredericton, N.B. ; to help redesign, renew and, in many cases, resuscitate dilapidated neighborhoods, waterfronts and downtown cores – always keeping in mind issues of sustainability and affordability.